After posting yesterday’s monthly Eloise picture I realized I don’t have any story for “the Gramma-made t-shirt quilt” Ellie sits against each month. 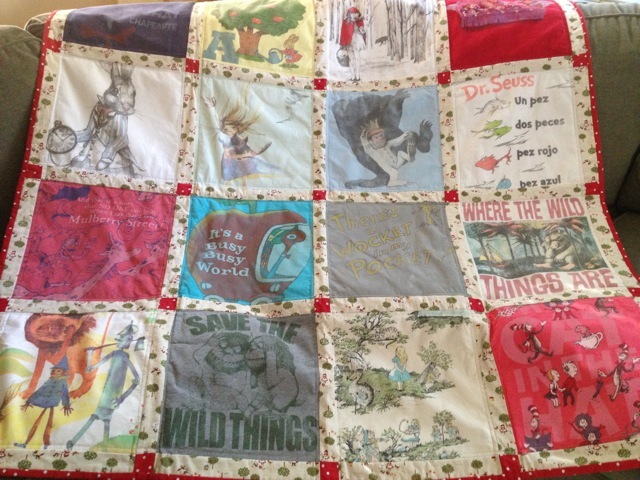 It’s such a wonderful, special quilt and it does have a back story that I thought I would share today. My mom is a quilter. She has been making beautiful things with her hands for as long as I can remember. But taking care of four children and a husband for thirty-two years, she hasn’t had much time to really quilt. However, now that all four of her children are grown, she can devote the majority of her time to making her rag quilts and selling them on etsy, which she enjoys immensely. 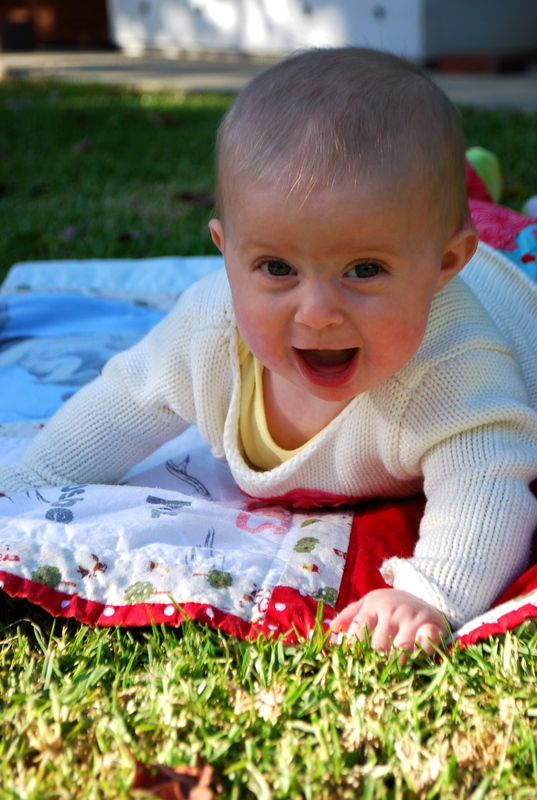 When I told her I was pregnant, I could see the quilting bug swirling around behind her eyes. 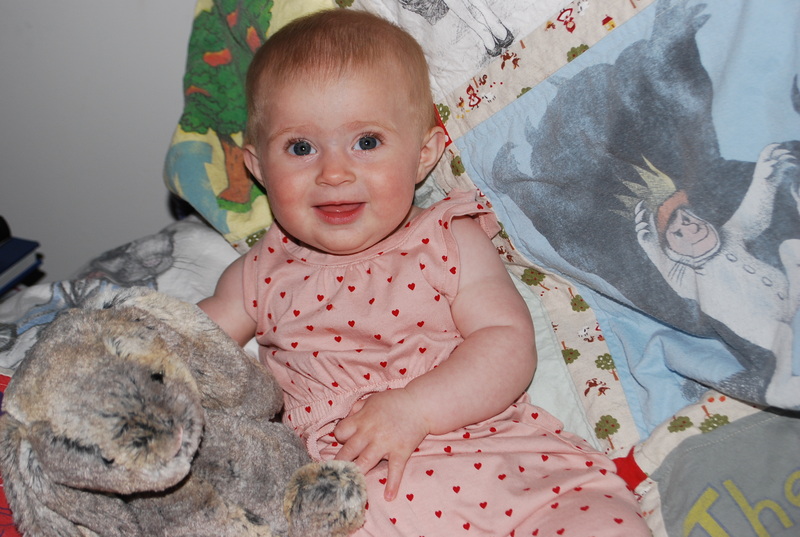 She was giddy with ideas of Gramma-made blankets to swaddle her first-born granddaughter with. I was thrilled to receive these handmade goodies for my baby girl but had one request (okay, I had a lot of requests), I wanted a t-shirt quilt made out of the fun, whimsical shirts I used to wear as a preschool teacher. I loved wearing these shirts every day to work. The children would comment on them and we would talk about what they found on my shirts. The children would relate the characters on my shirts right back to the books we were reading in the class. This made wearing these silly shirts every day, extra special. When I left teaching to stay home with my daughter, I wanted to do something special with the shirts and knew making them into a quilt would be fantastic. My mom had made each of my siblings and I our own t-shirt quilts with shirts from our high school choir/band days. I treasure that quilt and use it regularly as a picnic blanket now. 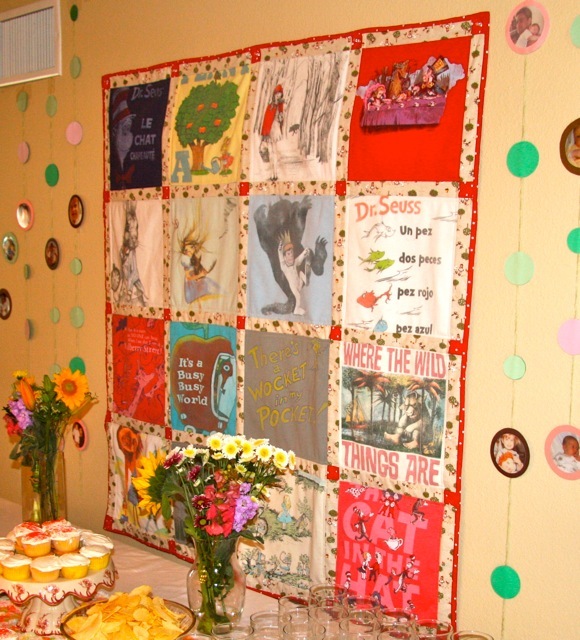 With this baby t-shirt quilt, my mom finished it just in time for the baby shower. It was hung as a centerpiece. 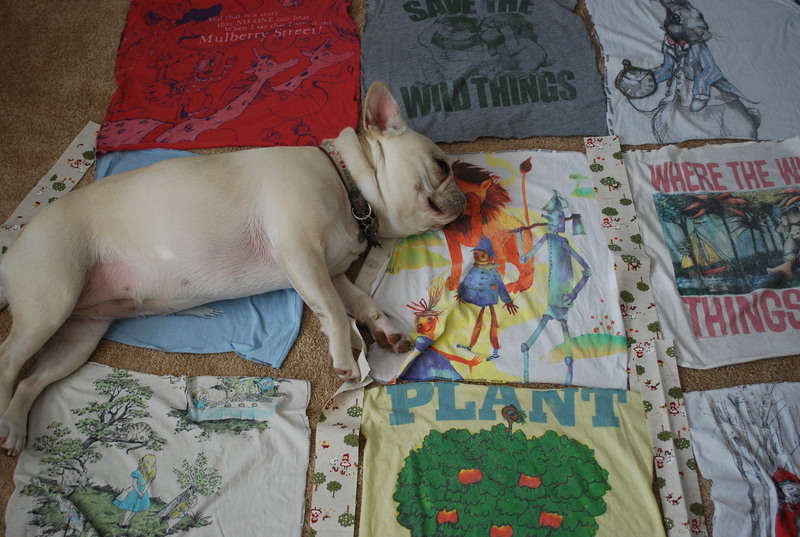 The adorable fabric used in the middle of the t-shirts is this. While I was pregnant, I was drawn to reds and Little Red Riding Hood for some reason. I thought this fabric would be perfect with my literary t-shirts. So now that baby girl Eloise is here, we have used this blanket almost every day in some way. 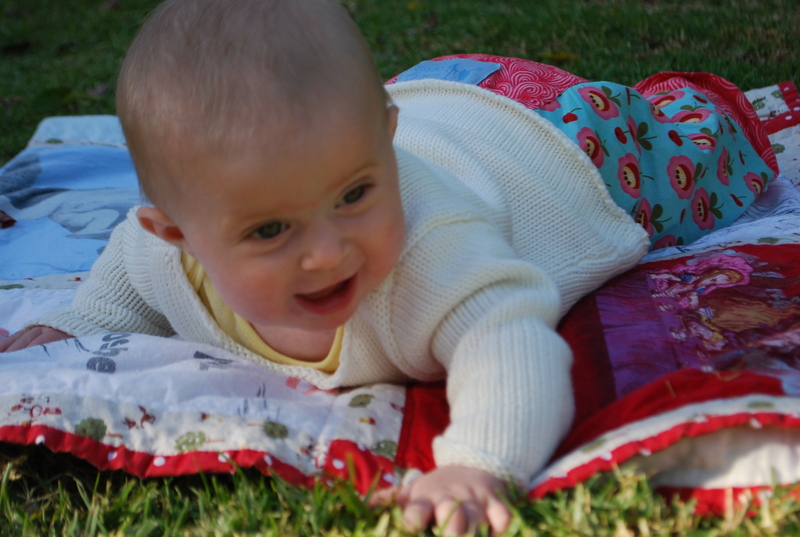 At the moment it’s our go to picnic blanket or outdoor play blanket. 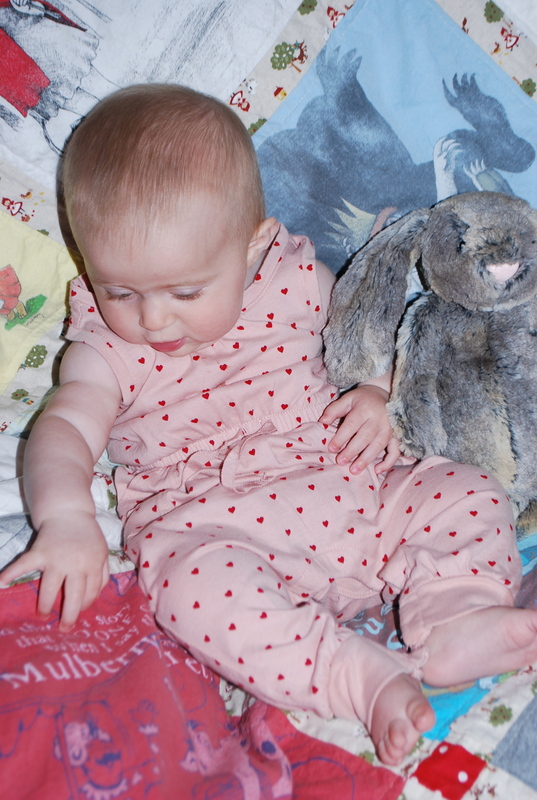 And of course, you see it every month in Ellie’s monthly photo’s. We love this quilt and are so very thankful we have a Gramma who loves sewing for us! 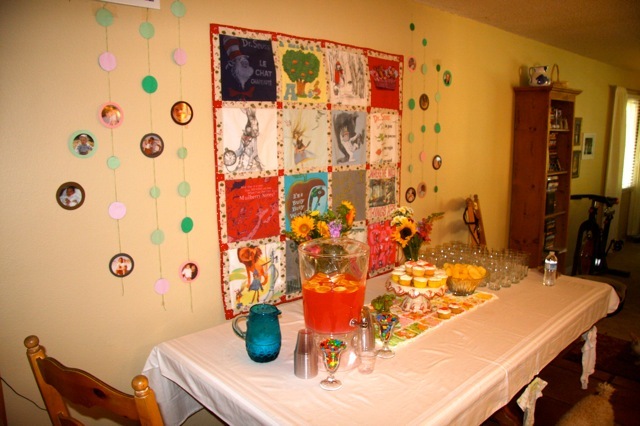 This entry was posted in Uncategorized and tagged baby blanket, gramma sews, t-shirt quilt. Bookmark the permalink. Wonderful pictures of Ellie, and once again your blog is very nice. What a wonderful mom you have and now your daughter will feel the same way about you. Thing is, you might have to learn to quilt. Hugs to all. thank you gramma! You know I do know how to quilt and have made a few of my own. But my mom is the master quilter. I doubt I will ever get as good as she is. 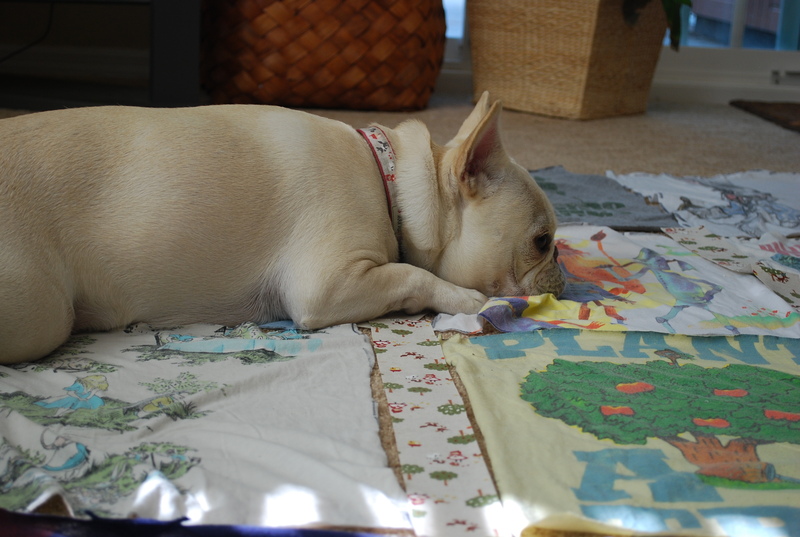 how lucky you are to have a handmade quilt…heirloom in the making as it will be full of memories. I am very lucky! My mom is a quilter and so is my cousin. Between the two of them (and my novice skills), I have so many incredible, lovely quilts and blankets to cover myself, my husband and my sweet baby. There is nothing like a handmade blanket on a chilly winter’s day. 🙂 Thanks for stopping by Amanda!